Various different certificates are used to guarantee the security of Password Safe. The certificates are essential for the smooth operation of Password Safe. It is thus important that they are carefully backed up. *Operation of the certificate manager is always the same. The only difference is whether the certificates are displayed for each database or for all databases. After opening the certificate manager, all certificates specific to Password Safe will be displayed. Clicking on the certificate will display further information. 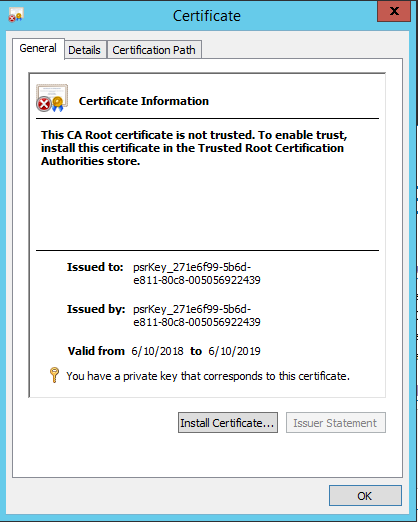 Double clicking on a certificate will open the Windows Certificate Manger to provide more detailed information. The overview will initially only display those certificates that are being used and are thus required. Clicking on All will also display the no longer required certificates. For example, it is possible that outdated certificates exist on the machine due to a test installation. These certificates can be easily deleted via the corresponding button in the ribbon. Previously backed up certificates can be integrated into the installation via the Import button. This merely requires you to enter the desired .pfx file and its password. 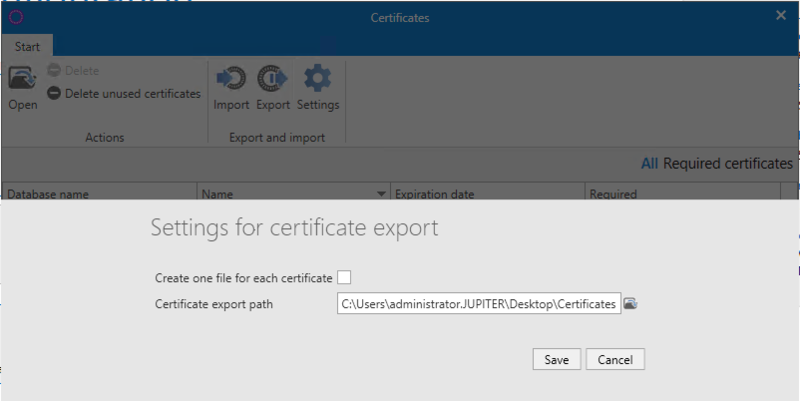 The relevant certificates will be backed up by clicking on export. A password firstly needs to be issued here. If a storage location has not yet been entered via the settings, you are firstly asked to enter it. *SSL connection certificates are not included in this process and are also not backed up. These certificates can be recreated if necessary. You can define whether every certificate should be saved to its own file in the settings. If this option has not been activated, all relevant certificates will be backed up in one file. In addition, the storage location is defined in the settings. If you want to automatically back up the certificates on a cyclical basis, this can be done via the backup system. Further information can be found in the section Backup management.